I went to college with this complete guitar freak who collected, among other guitar and music paraphernalia, guitar picks. He had tons of unique and personalized guitar picks and I'd have a lot of fun just looking over them when we would hang out at his place in between classes. He told me once that he actually made some of his own guitar picks himself. It was a long and lengthy process of cutting and shaping and smoothing, a whole lot longer than if he had the DIY Guitar Pick Punch that's now available from ThinkGeek. Use your old (and expired) credit cards, hotel key cards, cellphone prepaid phone cards, and any other hard or plastic or durable that you have lying around in your house or wallet. 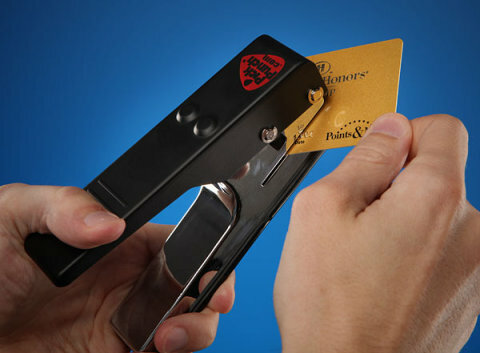 This puncher would also be the perfect companion to people who lose their guitar picks on a regular basis. Guitar pick missing? No worries. Just get a card and punch a pick out. And voila--you can now start playing some beautiful music.